After our diner breakfast, we set out en route to Bryce Canyon. 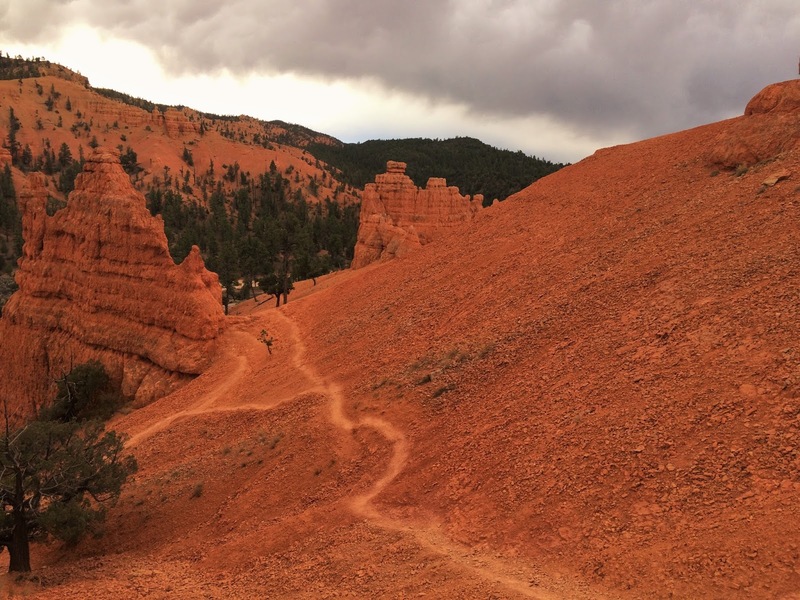 We stopped along the way in Red Canyon, which is impressive in its own right, and lives up to its colorful name. It was extra dramatic because it was cloudy at the time, and the sky added an ominous cast to the orange/red stone. After scrambling around on the slippery, flaky red shale (probably not technically shale, apologies to any geologists in the audience), we drove on — and up; the rim of Bryce Canyon varies between about 8,000 and 9,000 feet. After our crepe lunch, we stopped to gawk at the ‘best dam view in town’ (side note: small towns with hydroelectric monuments should be banned from making puns about them. There were two entire pages of ads in the hotel room binder for “the best dam restaurant in town” “the biggest dam shopping center” etc, and I love puns very much but even I sighed out loud over these). Glen Canyon Dam was one of the last large dams built in the US, and it created the second largest man-made lake in the country. The next morning we woke up early, around 6am, and I picked up some snacks from the hotel breakfast station. Then we went to the Navajo reservation, and checked in for our tour of Lower Antelope Canyon. I’ve had a picture torn out of a calendar from here since I was in my teens, so it’s been on my list of places to visit since then. There are two Antelope canyons — Upper and Lower. Both are part of the same wash (a.k.a. arroyo) — riverbeds in the desert that are normally dry, but flash flood after heavy rains, which may occur miles away. After we left Las Vegas, we drove to our first destination; Valley of Fire State Park in Nevada. Directions: drive on the main highway for awhile, then turn right. Be directed immediately with no room for argument through a complex obstacle course in a large dirt field, which is doubling as a parking area for an outdoor concert. After telling the various folks directing cars into parking spaces that no, you aren’t going to the show, in fact you want to go to the State Park, thank you very much, you’re directed back through the obstacle course in the other direction, and onto a small, but paved, state road. A half hour or so later, after lots of brown hills and scrub brush, go through a gate and pay the park fee, wondering where the ‘fire’ part comes in and hoping it’s worth the price of admission. Drive about ten more minutes, crest a rise, and find yourself on in a Dali painting set on Mars. The rocks are sculpted into tortured, organic, visceral shapes, and appear to be melting in the desert heat, their bright red intensified by the sun which is low in the sky behind you. Yep, this was definitely worth the park fee.